I often preach the benefits of wagering against a big favorite in the show pool when that pool is negative or near negative. Well, a perfect example of why I preach this occurred in the first race at Belmont Park on Thursday, May 26. 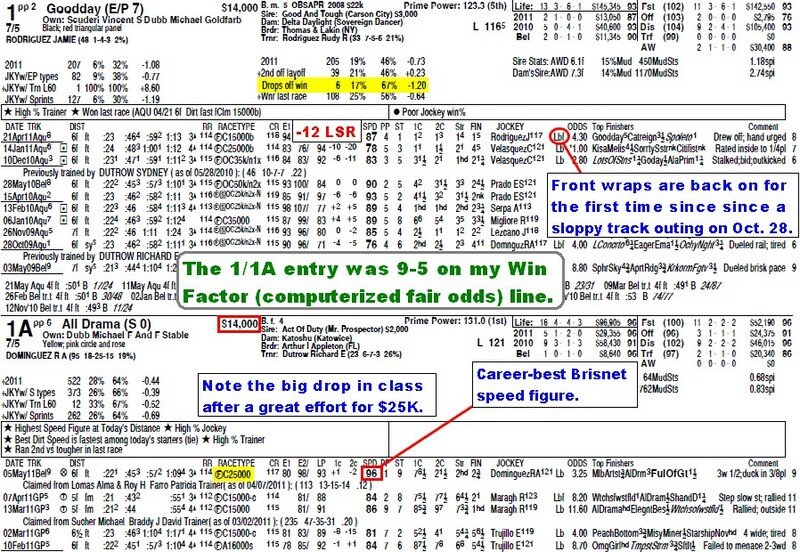 Before I discuss that interesting affair, however, let me briefly explain what a "negative pool" is: simply put, it is any pari-mutuel pool in which 75-80 percent (or more) of the total amount wagered is controlled by a single horse or entry. The term “negative” relates to the fact that the track must dip into its own coffers should the pool favorite be successful, e.g. finish first in the win pool, second or better in the place pool or third or better in the show pool. The track does this, of course, because there is a government-mandated minimum payoff of $2.10 (or, in some places, $2.20) on every winning $2 wager. Without boring everyone with the specifics, suffice it to say that in recent years, thanks to net pool pricing, these track “giveaways” have become more prevalent, hence reducing the effective takeout in instances where the heavy favorite is successful and providing for potential windfall profits when the favorite fails. Notice that $54,241 of the $64,018 (84.7 percent) in the show pool was wagered on the 1/1A entry, which consisted of Goodday and All Drama. Personally, I felt both horses were vulnerable, but, regardless of one’s feelings, this was a great race to find alternative show bets. I settled on 6-Say Toba Sandy, 5-Full of Gut and 3-Primal Baby (in that order) and was amply rewarded. Do yourself a favor and watch for these kinds of opportunities; in my opinion, they are among the best bets at the track. BET(S): WIN on 1 at even (1-1) odds or greater. BET(S): WIN on 1 & 3. BET(S): SHOW on 1 (if 75% or more of the show pool is controlled by 5). BET(S): WIN on 2 at even odds (1-1) or greater. EXACTA 2-7. BET(S): WIN on 4 at 6-5 or greater. You should definitely check this out if you want to know more about teaching. Here you can read about class entertaining, for example.